Check out this video clip of the rhythms of the Mawazine Festival! The eight edition of the Mawazine Festival will take place on May 15th to the 23rd. This years Rhythms of the World festival team has arranged an eight day program featuring well known artists like Kylie Minogue, Warda Al Jazayria, Alecia Keys and Stevie Wonder. 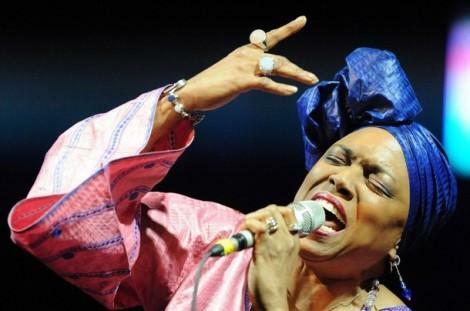 The Mawazine Festival will be held in Rabat, Morocco, with musician from over 40 countries. Located on the Atlantic Ocean, Rabat is a city has an estimated population of 2 million people and is the capital of the Kingdom of Morocco. The festival will bring together a diverse group of artists and rhythms to pay tribute to the music of the world. Morocco will also contribute a number of different artists like Casa Crew, Bigg, Mazagan, and Fez City Clan. Music from all different countries will be intertwined, with a primary theme of jazz music. The festival will feature Caribbean instrumentals, with artists who belong to the great Jamaican jazz groups like Ska Cubana, and Sly & Robbie. It will also feature French artists like Martin Solveig and Khalifa. The Legendary Stevie Wonder will close the Mawazine Festival’s program, with his epic R&B soul music. The Mawazine Festival will include musical creations, and exhibition of emerging artists with a desire for cultural exhange, workshops like the guitar master class, shows for children like Carton Park and Visto Lo Visto of Spain, and street shows featuring the Maharaja Brass Band of India, and the Romanian Ciocarlia Brass Band. Travel Exploration specializes in Morocco Travel. We provide Tours and travel opportunities to Morocco for the independent traveler and tailor-made tours for families and groups with a distinctly unique flavor. From Morocco’s Seven Imperial Cities, to the Magical Sahara Travel Exploration offers a captivating experience that will inspire you. At Travel Exploration we guarantee that you will discover the best of Morocco! Google on call Travel Exploration at (917)703-2078 and let’s book a tour to Morocco for you today. Moulay Idriss is a Moroccan town and important religious site and place of pilgrimage for Muslims located just an hour away from Fes. 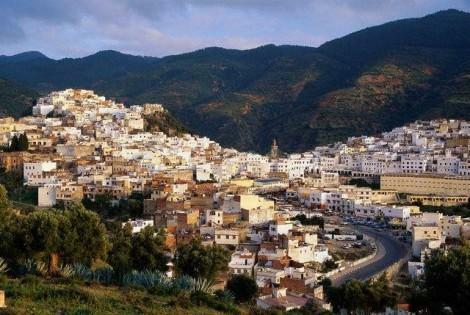 The city is named after the Moroccan saint Moulay Idriss, a descendant of Muhammad, who died and was buried in 792 AD in the city that was eventually named after him. During his life in Morocco Idriss founded Morocco’s first Arab dynasty as well as the city of Fes and is accredited with converting the majority of Morocco’s population to Islam. 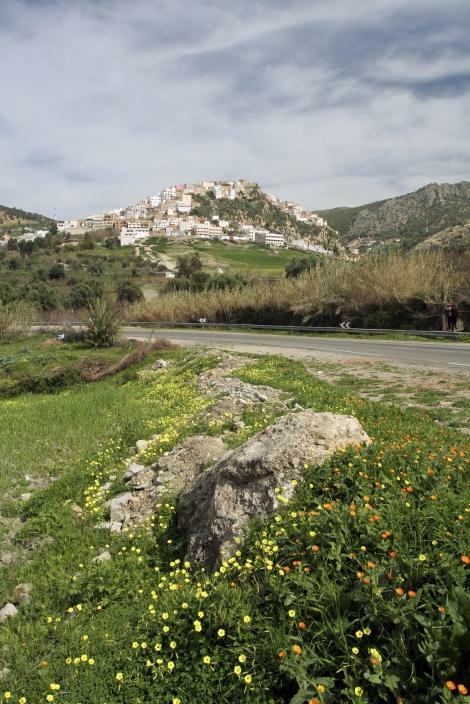 The Moulay Idriss itself is situated in a valley with lush green hillsides enclosing the white-washed houses of the city on three sides, making for a very beautiful sight. Today, Moulay Idriss’ tomb is a revered site and the city is considered to be the holiest city in Morocco. The tomb is considered to be a shrine and is accepted as a substitute pilgrimage for Muslims who cannot afford to travel to Mecca which, according to the five pillars of Islam, is one of the obligations of a Muslim man. Every August an important Moussem, or Muslim festival, is held in Moulay Idriss and Muslims from around the world come together to sing and dance in celebration of their faith. Although the tomb itself is not open to non-Muslims the sight can be enjoyed from the surrounding hillside or from one of the many taller buildings surrounding it. Located in Moulay Idriss is the Idriss Medersa, an ancient Koran school, which was built using materials from taken from Volubilis, an important outpost of the Roman Empire, located nearby. The Idriss Medersa is famous for its unusual Minaret, added to the building by a wealthy pilgrim in 1939. The Minaret is circular, an unusual design throughout the Muslim world, and is decorated with white and green geometric shapes that spell out a passage from the Koran in Arabic. Despite non-Muslims being barred from entering the shrine, Moulay Idriss offers many other sites and experiences for visitors. Its winding streets, whitewashed houses, and magnificent hillsides make the city a beautiful sight and well-worth the trip. A weekly vegetable market, or souk, occurs every Saturday and is a great way for visitors to get a true Moroccan experience. As for food, The Restaurant Trois Boules d’Or offers great food and spectacular views and don’t forget to try the nougat of Moulay Idriss which is famous and can be bought almost anywhere in the city. As both a starting point and a destination for merchants along ancient trade routes Morocco developed a cuisine that has Arabic, African, French, Mediterranean, and Middle Eastern influences. This blending of cultures and ideas makes Moroccan cuisine unique and often quite surprising. Extensive use of dried fruits such as dates and figs, preserved lemons, nuts, and the blending of fresh herbs and spices gives Moroccan cuisine its distinctive, and delicious, taste. 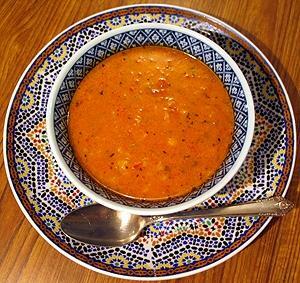 Harira is the famous soup of Morocco that is traditionally served during Ramadan at sunset to break the daylight fast. While every family has its own recipe with slight variations the traditional Harira is a tomato based soup with lamb, chickpeas, lentils, and pasta, infused with the flavors of lemon, cinnamon, cilantro, parsley, saffron, and ginger, and thickened with flour and egg. 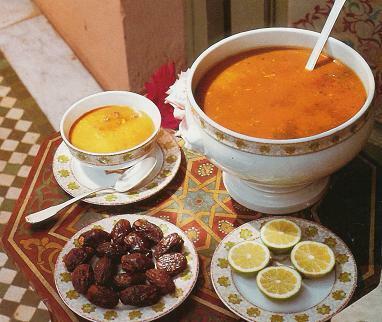 The soup is traditionally served with a lemon slice and crusty bread, a small bowl of lemon juice for those who prefer their soup with a little extra, and a plate of figs which are also traditionally served to break fast during Ramadan. While traditionally only served during Ramadan or at weddings Harira is a Moroccan favorite that is hearty enough to be served as a meal on a cold winter’s night, find the recipe below and don’t forget the crusty bread! Pick the parsley and cilantro leaves from their stems. Small pieces of stem are OK, but discard long, thick pieces with no leaves. Wash the herbs, drain well, and finely chop them by hand or with a food processor. Assemble the remaining ingredients and follow the steps below. Put the meat, soup bones and oil into a 6-qt. or larger pressure cooker. Over medium heat, cook the meat for a few minutes, stirring to brown all sides. Add the cilantro, parsley, celery, onion, chick peas, tomatoes, smen and spices. Stir in 3 cups of water. Add the lentils, tomato paste mixture, and 2 quarts (or about 2 liters) of water to the stock. Set aside (but don’t add yet), the vermicelli. Adding vermicelli: Cook the soup on pressure for 45 minutes. Release the pressure, and add the vermicelli. Simmer the soup, uncovered, for five to ten minutes or until the vermicelli is plump and cooked. While the soup is cooking, mix together the 1 cup of flour with 2 cups of water. Set the mixture aside. Stir or whisk the mixture occasionally. The flour will eventually blend with the water. If the mixture is not smooth when you’re ready to use it, pass it through a sieve to remove balls. Once the vermicelli has cooked, taste the soup for seasoning. Add salt or pepper if desired. Bring the soup to a full simmer. Slowly — and in a thin stream — pour in the flour mixture. Stir constantly and keep the soup simmering so the flour doesn’t stick to the bottom. You will notice the soup beginning to thicken when you’ve used approximately half the flour mixture. How thick to make harira is your own preference. I like to thicken the broth so that it achieves a cream-like consistency. Simmer the thickened soup, stirring occasionally, for five to ten minutes to cook off the taste of the flour. Remove the soup from the heat. Stuffed with almond paste, dusted with confectionery sugar and flaking with each bite, Moroccan pastries are reserved for special occasions. Cooking is regarded as an extravagant art in Morocco and in North Africa. Large meals are prepared for births, circumcisions, weddings, celebrations of the days of the profit and various other typical and Muslim specific holidays. Moroccan pastries and deserts are usually offered along with Moroccan Mint tea before the first course of a meal. When touring Morocco make sure to not miss out arriving on time if you are invited into someone’s home as this serves as the perfect opportunity for you to allow the sweeter part of the meal to linger. Moroccan cuisine traditions are an essential learning experience that can also be provided on a Tailor Made Tour through Cooking with a Daada Chef and bread baking with the Berbers.Travelers that have the opportunity to stay with a Moroccan family will experience a breakfast made for the kings. The host family traditionally will serve a variety of pastries for breakfast: Rghaif (flat buttery Moroccan pastries), Sfenj (Moroccan doughnuts), French pastries (croissants), along with Bayd (eggs, cooked with cumin and sesame seeds), orange juice or coffee. Pancakes are a traditional breakfast food as well as a sweet treat in Morocco. On holidays they are adorned with honey, icing, sugar, butter or a rich almond paste. Baghrir pancakes are fried in hot oil, with dot-like air craters on on side. These succulent Moroccan sweets were once only served to the sultans, Islamic leaders, and the elite. When spices were as prized as gold, lower classes were rarely able to partake in such indulgences. Now, when neighbors and friends come together during their afternoon break they enjoy the company with a pot of mint tea and pastries. The smell of fresh pastries linger through the city streets. All throughout the maze-like souks vendors sell a wide range of Moroccan sweets. A savory dish, native to Morocco, is bastila, a multi-layered pastry filled with shredded chicken or pigeon meat gently and brushed with a lemon-onion sauce and covered in almonds, cinnamon and sugar. Other flaky croissants are served with warm honey, apricot or other jams. 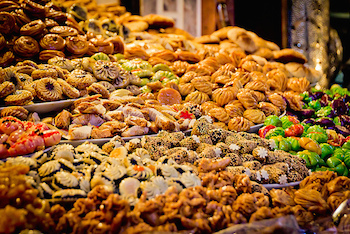 Moroccan deserts and pastries come in all shapes and sizes, generally pastries are light and healthy often made with nuts. Some are long and thin, others round- filled or hallow. 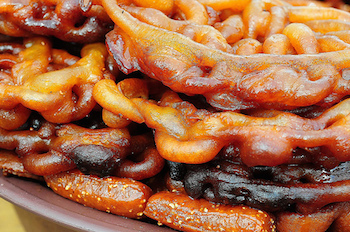 Gazelle horns, a crescent shaped treat is of the most famous Moroccan sweets. Check out the recipe below! Combine all the ingredients for the almond paste in a bowl, stir until smooth- divide paste into 16 pieces. In another bowl, combine flour and salt, melted butter, orange flower and one egg yolk, add cold water to form a soft dough. Kneed for ten minutes, roll out into a thing rectangle- then cut into strips. Place the almond paste on each pastry, spacing them 3 cm apart. Fold in half to seal the paste. Moisten both sides of the pastry with the remaining egg yolk and a small amount of water. Cut each pasty into a crescent shape, place on a buttered and floured baking sheet. Travel Exploration specializes in Morocco Travel. We provide Tours and travel opportunities to Morocco for the independent traveler and tailor-made tours for families and groups with a distinctly unique flavor. From Morocco’s Seven Imperial Cities, to the Magical Sahara Travel Exploration offers a captivating experience that will inspire you. At Travel Exploration we guarantee that you will discover the best of Morocco! Google on call Travel Exploration at 1800-787-8806 and let’s book a tour to Morocco for you today. Dates have played an important part in Moroccan cuisine for thousands of years. 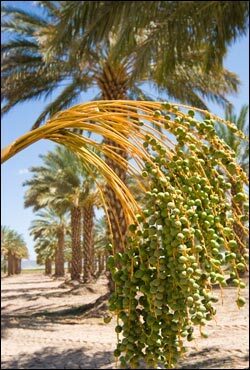 Archaeological evidence suggests the cultivation of dates all the way back in 6,000 BC in Arabia. The date palm was a major source of life for thousands of people throughout the Middle East and Northern Africa and is said to have provided people with thousands of different uses including thread, mattresses, lumber, rope, and many other household and dietary uses. Dates are also very important in Islam with the date palm regarded as the “tree of life” as mentioned in the Story of Genesis and also eaten to ceremoniously break fast during Ramadan. When visiting Morocco on a Tailor Made Jewish Tour or a Family Adventure Tour make sure to include Date picking in Morocco’s south as one of the activties in your travel itinerary. Morocco’s arid desert region is the perfect place for cultivating dates. Morocco today, boasts over 100 different varieties of dates with 45 qualities of those in the south of Morocco alone. 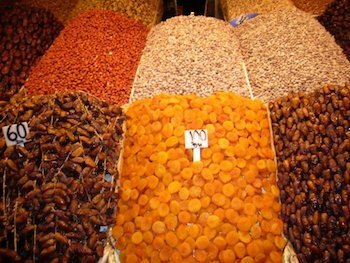 Of the many different varieties of dates the most popular are the Medjool, Algerian stuffed date, and the Halawi date. The Draa, or the Draa Valley, in Morocco is known as the “Country of the Dates” as its hot arid temperatures offer the date palm the perfect climate to thrive. The largest and perhaps the best-known variety of the Moroccan dates is the Medjool date. Often referred to as “the king of dates” it was once reserved only for Moroccan royalty and their guests.They were, and still are, considered a precious confection and are typically the most expensive of the date varieties because their cultivation is more labor intensive.The date has a soft wrinkled flesh that gives way to a firm meaty center.When ripe, the date turns a dark brown color and with hints of wild honey, caramel, and cinnamon it is no wonder this date is considered a gourmet dessert. 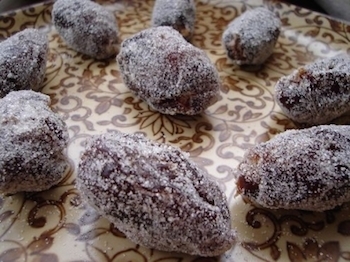 The Deglet Noor date, originally from Algeria, are the dates commonly used in Moroccan stuffed date recipes. Primarily an export crop, these dates are semi-dry with a firm texture and a sweet and delicate flavor. Ranging from a light red to amber color these dates actually make up 90 percent of the Californian date crop and can be found in many Moroccan tagine recipes. The Halawi Date is a soft wrinkled date with a meaty flesh and a sweet caramel flavor. While not as large or as favored as the Medjool Date the Halawi Date is still considered a delicacy and because of its soft sweet flesh and high sugar content it is often served as a dessert at Moroccan meals. Every October in the Moroccan town of Erfoud a three-day festival celebrating the date is held. The date is the main livelihood for the people of Erfoud so it is no wonder that this festival focuses on the celebration of the date harvest and prayers for a successful harvest to come. Endless music, dancing, and of course eating dates spans the three day celebration where locals and tourists alike gather together under the swaying palm trees. Dates play an extremely important part in Moroccan cuisine and are used in both sweet and savory meals. Below, find the recipes for a Beef tagine that features honey and dates and also a sweet recipe for stuffed dates, enjoy! Par-boil the carrots for 3-5 minutes, at the same time pre-heat your tagine or croc pot. Heat the olive oil in a frying pan and cook the onion until they have browned slightly then put them into the tagine. Add all of the remaining ingredients, except for the almonds and fresh cilantro, into the tagine and mix well. Put the beef into a pan and sear them until brown, add beef to the tagine. Cook the tagine in a hot oven for 6-10 hours or, if using a croc pot, cook on high setting for same amount of time. Serve over couscous and sprinkle with sliced almonds and fresh cilantro. Mix the ground almonds, sugar and egg white together. Put this mixture in a skillet and cook over a low flame, stirring constantly, until the mixture becomes sticky. Add 1 tsp water and cook 1 minute longer. Remove from the flame and let cool for several minutes. With this mixture stuff the dates and roll in confectioners’ sugar. Serve while the filling is hot or at room temperature. For more information about Date Picking on a Tailor Made Morocco Tour. Travel Exploration specializes in Morocco Travel. We provide Tours and travel opportunities to Morocco for the independent traveler and tailor-made tours for families and groups with a distinctly unique flavor. From Morocco’s Seven Imperial Cities, to the Magical Sahara Travel Exploration offers a captivating experience that will inspire you. At Travel Exploration we guarantee that you will discover the best of Morocco! Google on call Travel Exploration at 1800-787- 8806and let’s book a tour to Morocco for you today. Last years cries from the violin still echo off the ancient Roman ruins and the night’s faint stars add to the enchanting song. For the last thirteen years Jazz au Chella has made its home in the thick fortified walls of Morocco’s own capital city, Rabat. The Jazz Festival of Rabat serves as an annual mixer for world classical fusions and ancient Berber rhythms in efforts of uniting Europe with Morocco. The festival is programed and organized from combined efforts from the Delegation of the European Commission, the Ministry of Culture, the Embassies and Cultural Institutes of the European Unions member states with partneerships with the Wallonia-Brussels Delegation and the Wilaya de Rabat-Sale-Zemmour-Zaer. This five day jazz celebration features artists from over 15 different countries each with their own unique flair and specialties. A harmony of talented musicians join together to fill the city with the melodic rhythm of flutes, trumpets, strings and percussion. Crowded streets pulse with energy and spectators join hand and hand as they take part in a cultural exchange. Situated between the Atlantic and the Bou Regreg, Rabat draws cultural influences from across the distant shores. The old port town is also famous for its galleries, museums and theater. The population of Rabat is just over two million, making it one of the largest cities in Morocco. As a city that draws a large amount of tourism, Rabat is a must see for all visiting Morocco, and what better than to watch the city come alive during the Jazz au Chella. Nass El Ghiwane appeared on the scene in the late 1960’s in Morocco. Whenever mentioned in the Western literature, they are referred to as The Rolling Stones , as American Producer Martin Scorsese once put it. They have been the most politicized of all the chaabbi-fusion groups and placed great emphasis on their lyrics, which are renowned throughout Morocco and North Africa. Nass El Ghiwane are living legends who merged the rich repertoire of traditional Moroccan music with lyrics that sited political and social injustices. The group was formed by four young men from the poor district of Hay el Mohammadi in industrial Casablanca. Laarbi Batma (who came from the Chaouia region to Kariane Jdid) met Boujemaa Hagour (who came from the Tata (Morocco) region to Derb Moulay Cherif) through their mutual friend Omar Essayed. While performing the piece “Al Majdoub” in the theater troupe, Tayeb Essidiki, for Parisian crowds in the summer of 1969, they had the idea of using traditional music as a way to express themselves onstage. Hence Nass El Ghiwane was born. In a time where the only music available was middle-eastern pop music that sang about love, Nass el Ghiwane had prepared something new for Morocco: they mixed the Sufi chants and litanies of Zaouias (brotherhoods) like the Hmadcha and Aissawa with the elegant colloquial poetry of Melhoun adding to it the ancient rhythms of the Berbers and the healing dances of the mystical Gnaouas. Morocco just receiving its independence from the French and its population, still uncertain of what the future was hiding, was shocked and moved by the texts of Nass el Ghiwane: corruption, injustice and degradation of society. They were the first Moroccan band to mix such a diverse and rich heritage and to speak their minds even about the most forbidden subjects. East and West meet to form a unique emotional and cultural experience uniting the public with a shared sense of spirituality. The Fes Festival is one of the most popular festivals in Morocco. Artists come from France, Spain, South Africa, Turkey, Egypt, Iran, Senegal, Armenia, Poland, the U.S., India, Greece and Morocco to create a program with a wide range of art, entertainment, intellectual awareness, and spirituality. Every year the Fes Festival runs for a ten day series. Each morning there are a series of round table discussions promoting dialogue on cultural awareness and understanding. While there was an increase in conflict in the Middle East it became a crucial goal to increase the understanding. The founders aimed to bring together the world in its many faiths regardless of the historical atrocities. Musicians, authors and intellectuals come together in hopes to resolve pertinent issues of the times, discussing religion, democracy, music, social justice, conflict resolution and even climate change. Fes is known for its strong cultural, intellectual and spiritual presence. As a city at the heart of Moroccan civilization, and has been declared a world heritage site by UNESCO. The evening concerts are held at Bab Makina, the entrance to the Royal Palace. Afternoon concerts are held in the Dar Batha Museum, a slightly smaller area. 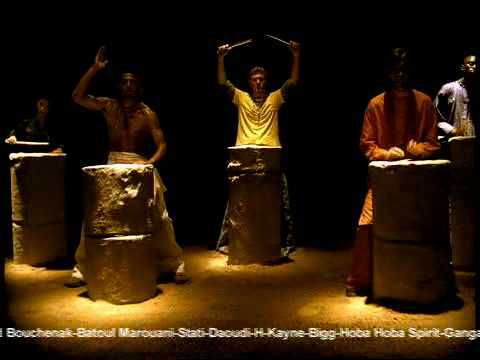 The drum is a crucial element for the spiritual music of the Fes Festival. 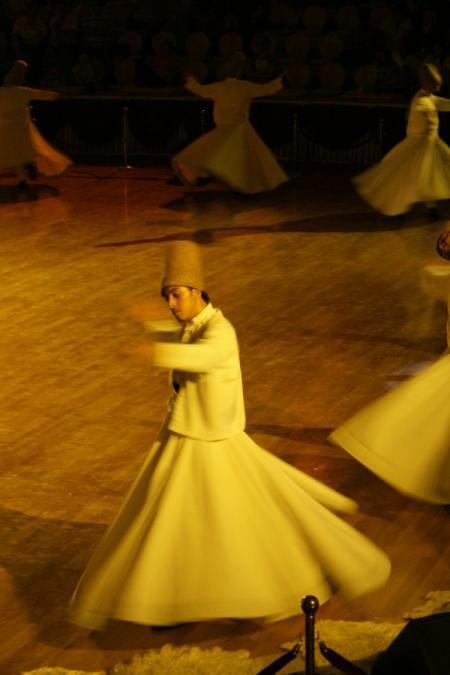 The festival comes alive with Sufi chants, Pakistani qawwali chants, flamenco Christian saeta, Egyption madhi odes, sacred incantations of ancient Indian and Turkish whirling. Locals often fall into chants from the hypnotic rhythms, and the Muslim call to prayer echoes over the loud speakers through the city gates. In recent years the festival has opened with Christian, Jewish and Muslim childrens chiors as a symbol of peace and unity. Along with the round table discussions and performances there are also film events, photography and art exhibits. This years program focuses on our origin, existance and individuality and will feature The Gospel According to John by Abed Azrie and Spiritual Songs from the Arab World lead by Sami Yussef. The festival will also focus on the balance between materialism and spirituality. For the past ten years one weekend every June the Moroccan city of Essaouira has come alive with the music of the world. From traditional Moroccan Gnaoua to jazz and blues the Gnaoua Festival and Musics of the World Essaouira offers music to suit any taste and is a must-see for music lovers worldwide. The Gnawa are descendants of African slaves who came together to establish brotherhoods throughout Morocco. 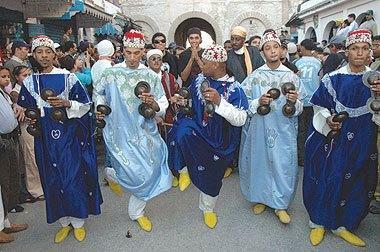 Despite being Muslim, the Gnawa blend African and Arabo-Berber customs to create their unique music-based rituals. These rituals are based on djinn – or spirits- that come straight from the African cult of possession. Their most important ceremony is Lila during which the maalem – or musicians – call upon the saints and supernatural entities to take possession of their followers. The followers and listeners of the music then fall into trances, the ceremony itself is said to be therapeutic. Beginning as a place for the Gnaoua to emphasize and appreciate its musical diversity and heritage The Gnaoua Festival invites jazz, blues, electric fusion, and Moroccan contemporary artists from around the world to perform at one giant festival. It is now celebrating its 11th Edition with over 500,000 festival goers. The city of Essaouira comes alive with the hums, beats, and dancing of thousands of music lovers uniting under one sky. The festival itself is comprised of 10 different stages, in different parts of the city, each one representing different artists and music from around the world. This year, in celebration of 10 successful years of the Gnoaua Music Festival, the Gnoaua musicians will be honored with a new stage. This stage, dedicated to them at Bab Doukkala, will allow their most dedicated followers and ardent listeners to experience a 100% Gnoaua concert. Gnoaua stars such as Hamid El Kasri and Abdelkebir Merchane will be performing the traditional Lila ritual every evening at midnight. On the Bab Sebaa stage jazz and world musicians will be playing, offering audiences a taste of music from around the world. From the Korean traditional percussion group Salmunori to the English bluesman Justin Adams, this stage is sure to delight and engage the crowd with its wide variety of sights and sounds. The Moulay Hassan stage, which is located at the beginning of the medina near the port of Essaouira, can support 30,000 people and is the place to experience the unique fussion of Gnoaua and world music. Combining traditional Gnoaua instruments such as the guembri – a 3 stringed percussion lute – and qraqeb – large metal castenets – with percussion, trumpets, and saxophones from around the world. Jazz artists such as Wayne Shorter and Eric Legnini are also performing and share the stage with the reggae of Kymani Marley. The festival ends with a grand performance by the National Orchestra of Barbes on Sunday night. For those wanting to experience the unique and moving sounds of Gnoaua and world music fussions as well as well-known jazz and reggae the Moulay Hassan stage is the place to be. Another large stage which can hold 50,000 people is the Bab Marrakech stage, set on 100 meters of the beach this stage offers the perfect place for people to meet and dance to the rhythums of world music. These two stages, both smaller in size, offer audiences the chance to experience the music of different folk groups from around the world. 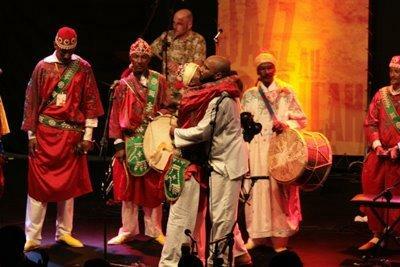 At 3:30pm both stages change and the magical Lila music of the Gnaoua musicians begins. For those looking for more modern-day Electric sound this is the stage for you. This stage creates a fusion between traditional fusions and talented well-known DJ’s . The fun and energy at this stage is guarrenteed to get you up and dancing long into the night. For those looking for a more intimate atmosphere to listen to music Dar Souiri and Kebir’s Place offer acoustic foreign and Moroccan music and traditional Gnoaua music in a small warm setting. As these two venues can only welcome 250 people space is limited so get there early! The Young Talents stage offers up-and-coming Moroccan artists a chance to showcase their skills. Audiences can come for the chance to see the next big thing in Moroccan music. So whatever type of music you love, whether it is the ritualistic ceremonies of the Gnaoua, the smooth tunes of jazz, or the catchy beats of the bongo drum, The Gnaoua Festival in Essaouira is the place to be. A place where the music of the world brings the people of the world together. You are currently browsing the archives for the Festivals In Morocco category.